It is a beautiful sight to behold one of you having a moment of awakening. We see the awakening experiences occurring on your planet, and each time it happens, another light is shining more brightly. 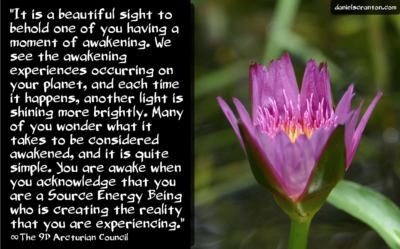 Many of you wonder what it takes to be considered awakened, and it is quite simple. You are awake when you acknowledge that you are a Source Energy Being who is creating the reality that you are experiencing. Now, you are not always going to maintain that truth in your consciousness as you navigate through your lives. You are going to have moments where you feel quite separate from the person in the car that just cut you off. There are going to be times when you feel like a victim. There are going to be times when you judge others, but the beauty of your status as awakened beings is that you will always come back to the truth of who you really are. And when that really sinks into your consciousness, you will also be looking at others in the same way. You will see others as Beings of Light and Love. You will see them as Source Energy, and you will accept that others will create experiences that are different from yours. You will accept their creations without judgment. You will come to know that whatever someone else is dabbling in, they will also be coming back to the truth of who they are, and they will somehow be better off for having had the experience. It is so important that you allow each other to have different experiences and to co-exist harmoniously, not feeling threatened at all by what anyone else is doing, and certainly not by what anyone else is believing. When you truly embrace the truth that you are Source Energy Beings, you understand that everything that you experience stems from something inside of you. And so the more you turn your attention back on yourselves for the truth of who you are and for the momentary vibration you are offering, the more awakened and enlightened you will become. This is your destiny. This is the destiny of every single human who is living on Earth at this time. Some of you will get there sooner than others. And when you do, you will reach out as Source Energy with a compassionate hand.